Adventure has been a significant source of influence and inspiration not only for the lineage of traditional text adventures that followed, but also for storytelling and game culture as a whole. The games we enjoy today are, in part, the legacy of a caver and a programmer whose work represents one of the earliest successful attempts to create an immersive and dynamic feeling digital world. 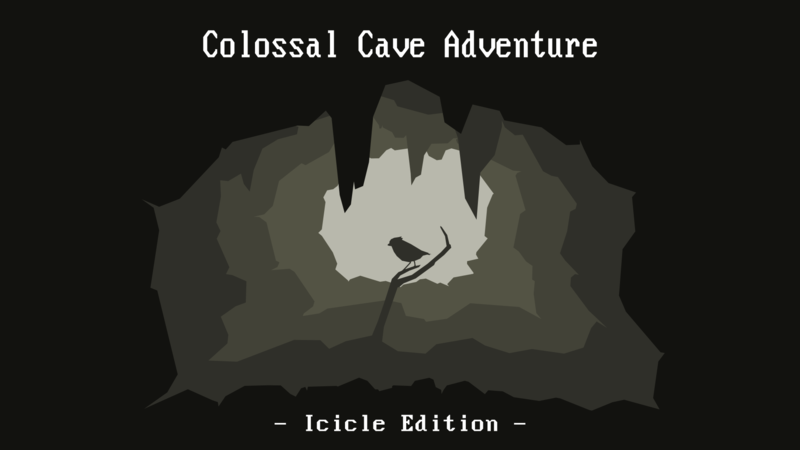 A playable demo of Colossal Cave Adventure - Icicle Edition is currently available, and can be found via the links below. For more information, feel free to reach out via email or Twitter. Adventure was first released in 1976 by Will Crowther in an incarnation that featured fewer puzzles and fewer game-oriented features. When Don Woods first played the game he was inspired to make some changes and contacted Crowther to ask if he could have access to the source code. The origins and lineage of Adventure's various versions are labyrinths unto themselves. Since its initial release, the game has been through many revisions, and like any influential work that's from a time when it wasn't considered important, some details have been lost. The mythology and legendary presence that Adventure retains is fascinating in itself. Below are some links to well researched works on Adventure for further reading. Jason Dyer's A History of Early Versions of Adventure is a good resource for learning more about the various versions of Adventure. Dyer's Extra Comments About Crowther's Original Adventure also sheds some light on the game's initial incarnation prior to Woods' involvement. Dennis G. Jerz's comprehensive study of the origins, influences and impact of Adventure, Somewhere Nearby is Colossal Cave: Examining Will Crowther's Original "Adventure" in Code and in Kentucky gives some wonderful detail on Adventure's nuances, and touches on some of the misconceptions that have arisen around the game. The 2010 documentary Get Lamp, opens with a tour of the cave system that inspired Adventure, and looks at the history of the genre that Adventure helped define. In Colossal Cave Adventure - Icicle Edition, additional scenes have been added to preserve scene exit/entry alignment. Several other content tweaks such as action icons and expanded or rephrased descriptions have been made to better suit the Icicle engine's format. For future releases, audio, music and extra scene content will be added. Beyond expanded descriptions, ground and sky objects, and joining scenes, the following changes have been made to provide an experience more in line with the Icicle engine's strengths. Copyright 2016 Josh "Cheeseness" Bush & Henry Bush. Hero font courtesy of Fontfabric.